Hi, we have Two Females who are Dark Red with one having white socks. they have had the first Vaccination & second done with Microchipping and wormed to date also they have had the flea & Tick Treatment. the puppy will go to a loving home with puppy pack / Toy / blanket / Puppy Milk. With 4 Weeks free pet plan insurance. They are ready to go to a new home now and should you wish to View our puppies please phone me or text due to not always be at my computer to check E-Mails. I would be happy to answer any questions you may wish to ask regards the puppies. Both parents can be seen. 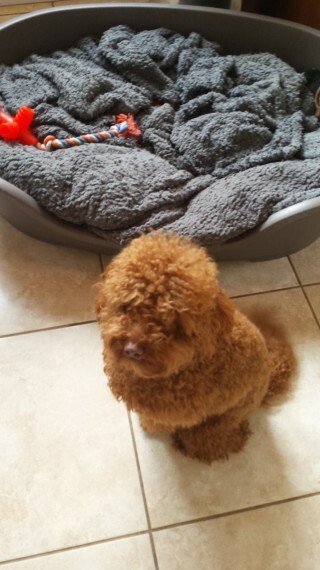 We own both Mum & Dad, Dad is a Kennel Club Registered Toy Fox Red Poodle this poodle is the smallest of that breed. F1. The Mum is a Toy poodle F1b cross with a King Charles Cavalier Spaniel who is Apricot and white. they have wonderful temperaments and love to please they like to play with children. we have owned them since 8 weeks old. the puppies wear born in the kitchen at our home and are use to every day noise within the home. The puppies are now weaned off mum and feeding well on soaked down Royal Canin with Chicken / Lamb / Beef. With Goats Milk / and puppy Royal Canin Milk. Adopting, or buying a new puppy or dog is an important decision and big responsibility. As an owner, you will solely responsible for the welfare of your new pet and will also be financially committed. Before you decide to buy or adopt you must ensure that you’re 100% committed beforehand. For further information on caring for puppies and dogs, please visit our pet advice section. You can also find out more information about the Cavapoo breed by visiting the Cavapoo Dog Breed Information.